A brief overview of the process and content of Latvian MSP with information on the legal framework, time schedule, public participation etc. 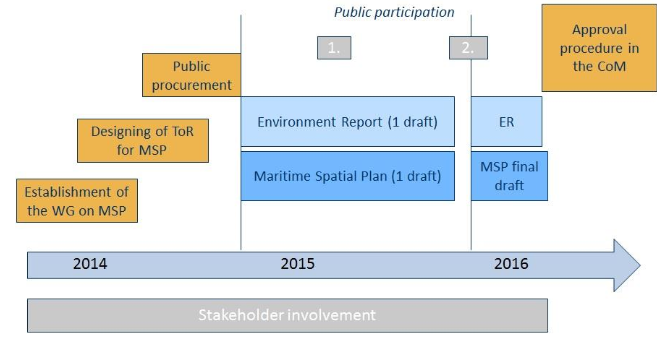 What has been the process of developing the Latvian Maritime Spatial Plan? Regulations of the Cabinet of the Ministers Nr. 740 on Development, Implementation and Monitoring of Maritime Spatial Plan have been approved by the Latvian Government in 2012, where the content, elaboration procedure as well as implementation and monitoring procedures of MSP are defined. Plan must be submitted and announced through ordinary legislative procedures according to the Cabinet of Minister rules of order. The Government shall approve the MSP. Marine Environment Protection and Management Law enforced on 18 November 2010 defines the maritime spatial planning as a long-term process for development planning aimed at protection of marine environment, rational use of the sea and integrated management, as well as balancing the social welfare and economic development with the environmental protection requirements. The Law requires to apply ecosystem approach, including featuring of the characteristics of the Baltic Sea, as well to take into account marine environmental status and trends. Prepare Strategic environmental assessment of the MSP. Describe current and future Transboundary consultations on MSP and SEA. The MSP and ER is developed closely with stakeholders and input received via public participation activities implemented throughout the planning process. In Latvia, public participation is implemented by formal (for example, associations, foundations, trade unions, employers’ organisations, religious organisations) and informal (unregistered initiative groups, interest associations) groups of the public, as well as individual natural persons (hereinafter –public representatives). to adopt the terms of the reference for development of the MSP. National Maritime day on 21 May, 2015. The legal procedure for transboundary consultation is laid down in the legislation on SEA. Therefore a notification letter issued by the Environment State Bureau (under MoEPRD) was sent to the competent authorities of Estonia, Sweden and Lithuania on March 27, 2015. The letter informed about launch of the MSP and asked about the interest in transboundary consultation on SEA. The positive responses on the interest to take part in the transboundary SEA consultation were received from all three countries by the end of April, 2015. Cross-border consultation meetings with Estonian and Lithuanian stakeholders are scheduled for July 2015 and January 2016. The process has been elaborated for the Latvian MSP specifically. However, other MSPs have to take into account similar processes. This practice can therefore form an inspiration for other countries in the region.